Becca King and her mother are on the run from her stepfather who has used Becca’s talent for hearing ‘whispers’ to make a large and illegal sum of money. Now their options for safety are running out. In the town of Langley on Whidbey Island, Becca finds refuge in the home of her mother’s childhood friend while her mother continues on to Canada in search of safety. But on her first day in town Becca meets sixteen years old Derric Nyombe Matheson a Ugandan orphan who was adopted as a ten-year-old by the town’s Deputy Sheriff. Derric has a secret that no one on Whidbey Island knows. Derric and Becca form an un-severable bond. Becca is convinced that she’s the only person who can truly help him, and just maybe Derric can convince Becca that life is too short to live on the run. This is another of my reviews featuring an already established author trying their hand at the YA market (Jodi Picoult and Jane Casey are two I’ve already reviewed). 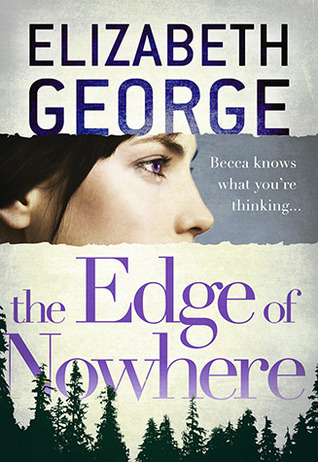 Elizabeth George is best known for her Inspector Lynley novels of which she has now written over 15. I thought it would be interesting to see if she could carry the crime genre over to the YA sector when she is already doing very well in the adult market. Hannah Armstrong has a power - she can hear what people are thinking. She is not the first in her family to be able to do this; her grandmother can too, so she wears a headset that produces white noise to eliminate her ability to hear others. Unfortunately she doesn’t wear it all the time and hears her stepfather revealing things he wouldn’t want others to know. Bad news for Hannah though, he’s worked out she somehow knows and now she and her mum are on the run. Enter Becca King, dowdy, boring teenager who is about to move to the remote Whidbey Island to stay with an old friend of her mother’s. The downside is, she arrives and her welcome goes slightly astray when the lady in question turns up dead. Now Becca has nowhere to go and no one to turn to. Luckily for her, Debbie Grieder takes in waifs and strays and is no stranger to having a secret or two. Becca soon settles into her new life, and makes some new friends in the bargain: Seth Darrow and Derric Mathieson, former best friends who now can’t stand each other. What do the boys have to hide? 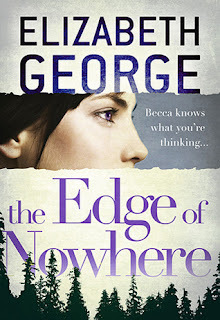 The Edge of Nowhere is the first part of the Saratoga Woods trilogy so expect plenty of unanswered questions when you get to the end of this book, that may, or may not, be answered in the next part. The story does flow well, and although it is less than 300 pages long, it is rather wordy and there are a lot of characters to get to grips with. My biggest doubt was whether anyone would believe Becca’s story of coming to the island to stay with her mum’s friend whilst her mother was away. Would a mother leave her teenage daughter in a place she doesn’t know and then not get in contact? This isn’t questioned in the book though and I guess maybe sometimes in fiction you don’t need to address things that you would in real-life. The characters all have other secrets of their own that they want to hide, so they don’t pry too hard into Becca’s life. Little do they know she can read their thoughts! Another trilogy? This probably isn't for me.